This week kicks off with the latest title in the DC Comics New Age of Heroes line... 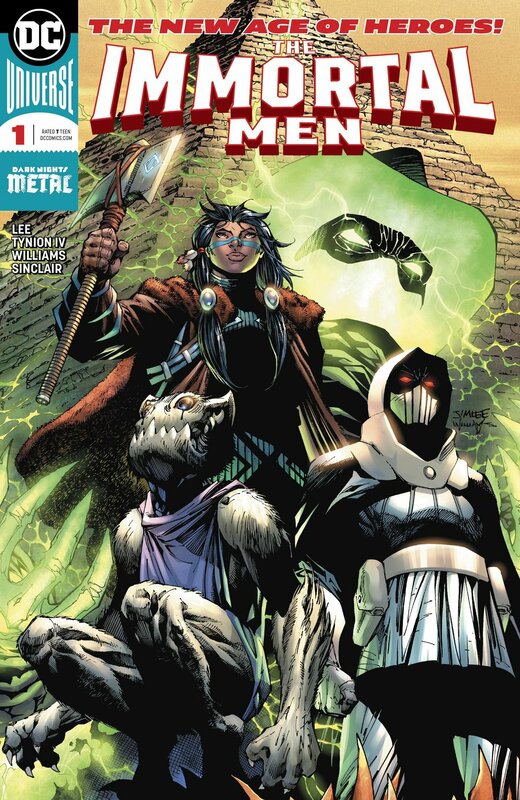 The Immortal Men #1!, from writer James Tynion IV and artist Jim Lee! There is a secret history to the DC Universe of heroes who have protected humanity from the shadows since the dawn of time...and who can live forever. Enter the Immortal Men! We're also ramping up for next week's Action Comics #1000 with a beautiful hardcover this week called Action Comics: 80 Years of Superman! Meanwhile, Marvel has several #1 issues coming out including Domino #1 and Exiles #1! Don't miss the anniversary issue Captain America #700 either, or Old Man Logan #38, Avengers #688, Thanos #18, and X-Men Red #3! Image has a solid week, too, with a couple #1 issues of its own: Crude #1 and Dead Hand #1! Plus there's Oblivion Song #2 and VS #3! Click here to see a tentative list of new comics shipping next Wednesday, April 18!